The moon dial is designed to show the shape of the moon as it appears in the sky, the number alongside it being the lunar date. The numbers on the dial are of the Lunar Calendar and NOT the calendar date. A lunar month has consistently twenty-nine and a half days in every month and these are usually lettered in Arabic (English) numerals. The Full Moon always occurs on the 15th day of the Lunar Calendar. If it were a full moon today, the image of the moon on the dial would be centered below the 15 on the dial. There are two moons on the dial and it makes no difference which one is under the 15. Grandfather clock moon dials consist of a round disk displaying two pictures of the moon. A one-half rotation of the disk occurs every 29.5 days which is one lunar cycle. If you have a Grandfather Clock with moon phase, follow these instructions. 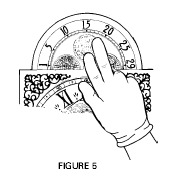 To set moon dial, apply slight pressure with your fingers to the front of the moon dial. Rotate the moon dial Clockwise until the moon is directly below the number 15 on the dial. (See figure 5). If the moon dial will not rotate, wait 6 hours and try again. Never force the moon dial as it should move easily. It may be on the 3-hour cycle where it is moving the dial…wait a few hours and you should be able to easily move the moon phase dial. 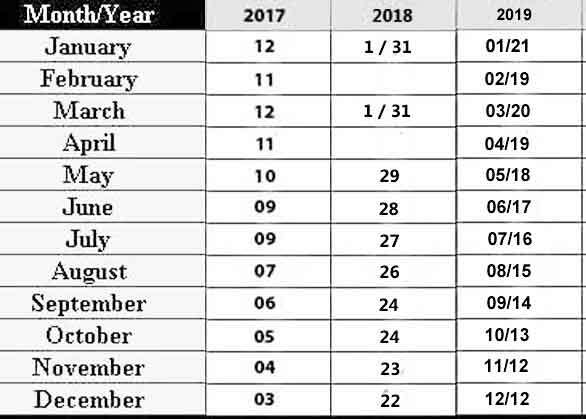 1) Using an almanac, lunar calendar or the chart below to determine the date of the last full moon. 2) Position the moon dial so the moon is under the 15 on the dial. 3) Count the number of days past the last full moon on a calendar. 4) Turn the moon dial Clockwise one click for each of the numbers of days past the last full moon. The moon dial is now set and will indicate the proper moon phases as long as the Grandfather Clock operates continuously. Let’s pretend today is the 20th of any month. Your almanac or lunar calendar says the full moon occurs on the 25 of this month. Set your moon dial on your Grandfather Clock so the moon is under the 10 on the dial which is 5 days before the 15th day the dial which is the full moon. If the Grandfather Clock with moon phase dial stops for more than 24 hours, the moon dial will also stop and must be reset when the Grandfather Clock has started again. One of the most frequently asked questions by new clock owners is, “What is the purpose of the moon dial and what do the pictures or symbols stand for”? The question itself tells us just how much the world has changed. Today it is difficult for us to realize just how important the ever-changing phases of the moon were in times gone by. In the late 17th century, the moon dial was added to most long case clocks so that people could plan ahead for when the moon was full and travel at night was not so hazardous. Clockmasters endeavored to simulate and approximate the appearance of the moon, in each of its phases, on the face of clocks. The arched dial was first used in clocks at the beginning of the 18th century and presented a real challenge to the makers of fine clocks. By approximately 1720, moving figures began to appear in this space, figures which moved back and forth with the swing of the pendulum. Among them were prancing deer, rocking ships, and Father Time with his scythe. At the time, there was no practical value to this feature on the clock, it was done simply to the delight of those viewing the clock. After motion had been added in the arch above the dial, the next step was to reproduce the progress of the moon from phase to phase. The proverbial “Man in the Moon” was used on most dials with a landscape and/or seascape on the other half of the circle. A rocking ship was a frequent symbol of the sea, with a deer often representing the land. In our very modern world today, the moving moon section of the dial is more decorative than useful, but it is still a very sought after feature. Many beliefs concerning the moon and its effects have been recorded. • Sweep the house in the dark of the moon and you will have neither moths nor spiders. • Trees planted at full moon will bear fruit. • Plant peas and potatoes in the increase of the moon. • The number of snows during winter is indicated by the number of days from the first snow in fall to the following full moon. horns of the moon are turned down and will not warp and rise up. The same holds true for boardwalks. There are two moons on the dial itself and each moon is 29 1/2 days apart, so it makes no difference which one you use. If the clock continues to run, you will see each moon on totality 6 times a year. They will continue to alternate as long as the grandfather clock is running. Either moon will represent a full moon. The dial needs two so that when one moon phase is complete, the next one begins. It will take 59 days, two moon cycles, for the moon dial to make one complete rotation. So, which ever moon is closest, move to the top position when it is a full moon outside, to make it simple. Or you can calculate the days as explained above for a greater challenge between full moons! The most direct question seems impossible to get answered anywhere! I just want a “visual” as to what my “moon” display is supposed to look like TODAY, JULY 10TH 2015? Sound as like an answerable ? to me. It is easy, but I don’t have an image. the number 25 at the top of your dial. The full moon was on the 1rst of July. We are now 10days after the full moon. On your dial, the full moon is under the number 15..always. The moon should be under the 25 on 07-10-2015. I could not find a site that would tell me how to set the moon face. Now I know. Thank you for the info. We have a Colonial gandfather clock and was directed to your website by a friend. The moon phase was not working so I reset it. I was told, growing up, to plant during a full moon. As the moon affects the ocean tide, it also pulls water closer to the surface of the soil. Interesting reading, this site is! Thank you! This is an awesome site. I actually won a grandfather clock with a moon dial. My dad received a grandfather clock one Christmas and I grew up with one so I love hearing the chimes. However, his clock did not have a moon dial. I was interested in the history as well as the operation of the moon dial. This site was so informative and helpful. Thanks so much!! I am so grateful to have finally gotten an answer that has eluded me since my grandfather built my clock in 1977. Thank you for the information! Just reset my grandfather clock after being away a week. This article made setting my moon very easy to understand. Thank you! No one else ever explained it so simply. Nice to start the day feeling smart!!! Thanks much for your easy to follow instructions. The history was a nice bonus! The moonphase circle just keeps freewheeling around. no clicking. The 2018 dates will be finished today! Thanks for the reminder.